When we first bought our property one of the aspects about which we were most excited was the 100 year old orchard near the site of the original farm house. 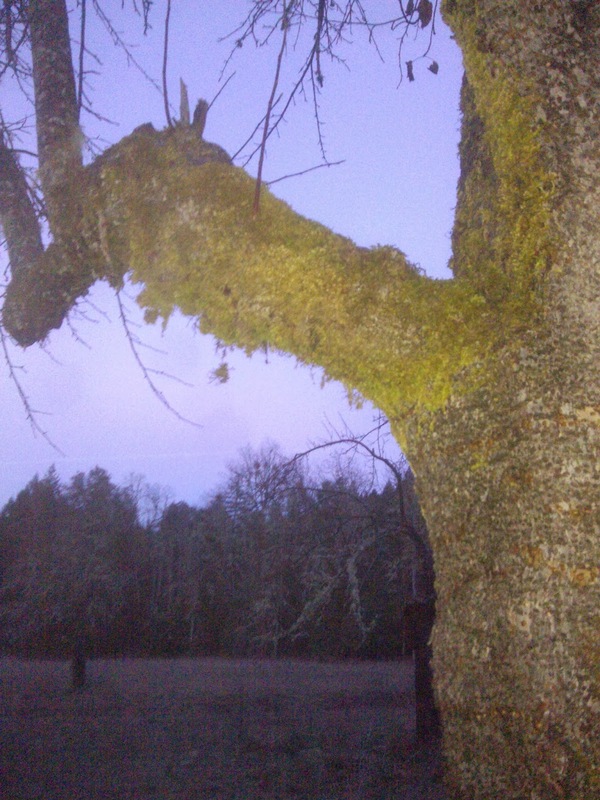 Unfortunately, decades of neglect had led to broken branches and a significant moss problem. This is one of our apple trees. In the background you can see the "old man's beard" growing on additional apple and pear trees. Over the past 2 years we have been slowly trying to nurse the orchard back to health. Last year was marked by some pretty intense pruning of most of the trees. 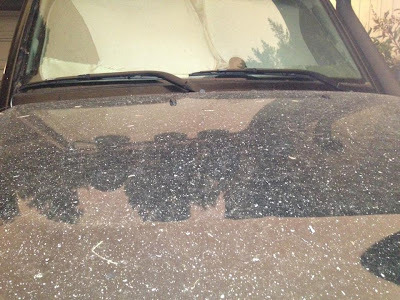 Unfortunately, the moss remained a major problem. We really wanted to maintain organic standards if at all possible, but we also wanted healthy trees and worm free fruit. This year after much consultation with our local nursery we are armed with a plan. 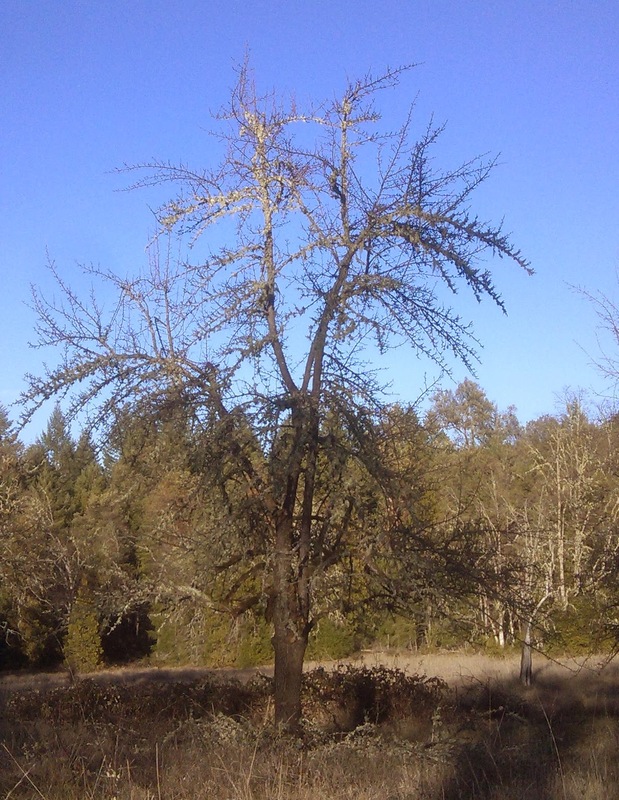 I will go into more detail in my next post, but through 4-5 sprays over this year we should be able to get our trees moss/worm free, but still meet organic standards. 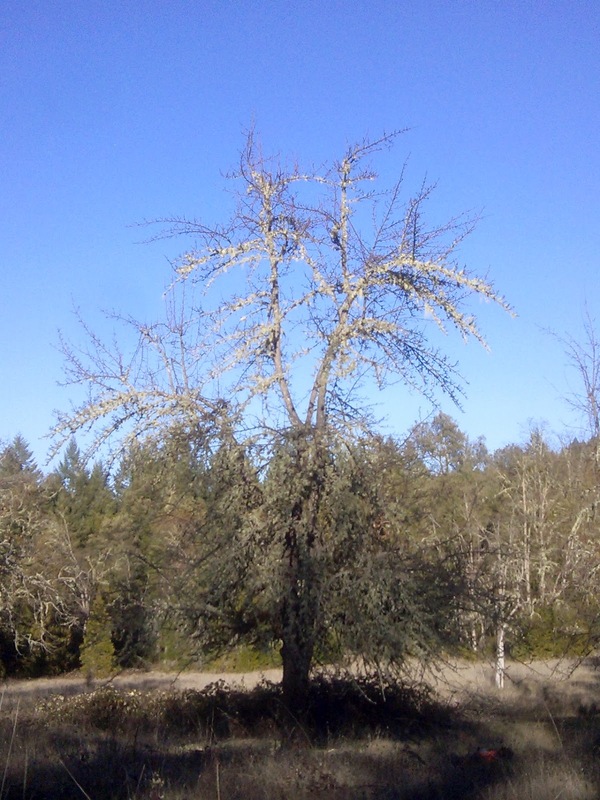 This is one of our pear trees that remains to be pruned. This was one days work, but as you can see there is much more to do. We are excited to get this area into shape. We added a cherry tree and 2 apples last year, and this year hope to diversify with even more fruit. ...there's fire. 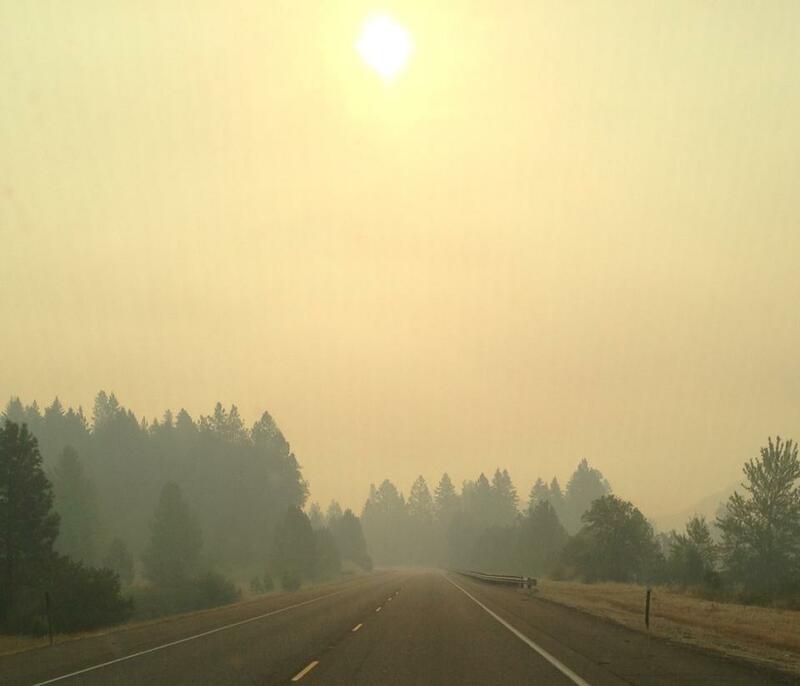 Southern Oregon has been transformed into an eerie appearing landscape secondary to several out of control wildfires that cropped up as a result of a recent lightning storm. Although I enjoy the smell of campfire the snowstorm like flurries of ash are more than a little disconcerting. 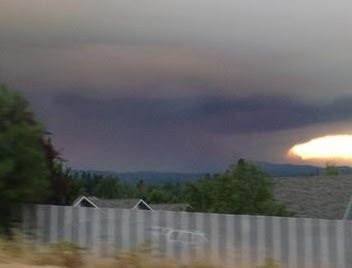 Here is a picture of the smoke plume as you drive out of town toward our house and and into the smoke plume. So, currently we are trying to stay indoors as much as possible and hoping that the firefighters are able to get a handle on these fires before too much more damage is done. Wild strawberry season is in full swing around our parts. Nothing says summer like those tiny sweet red berries. Our family loves foraging, as far as we are concerned it is like hiking with a purpose. We go out and explore and it allows you to connect with the land in deeper and more meaningful way, as well as forcing you to really open your eyes and see your surroundings. At different times of year we forage things like miner's lettuce, fiddleheads, dandelions and acorns. For children of course, the gold standard is any type of berries. The first wild strawberries are the start of that season. They are followed by Blackcap Raspberries, Trailing Blackberries, Himalayan Blackberries and Huckleberries. The little thimble sized berries hiding on the forest floor. The first of many handfuls, with some not quite ripe ones courtesy of my helpers. Sticky fingers, and of course sticky mouths, at the end of the day! 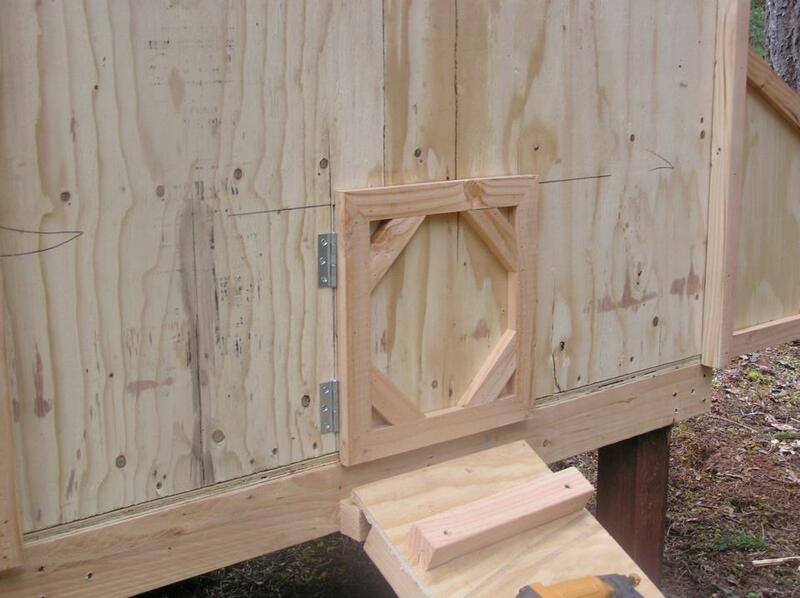 Building a chicken coop if not difficult to do on your own. 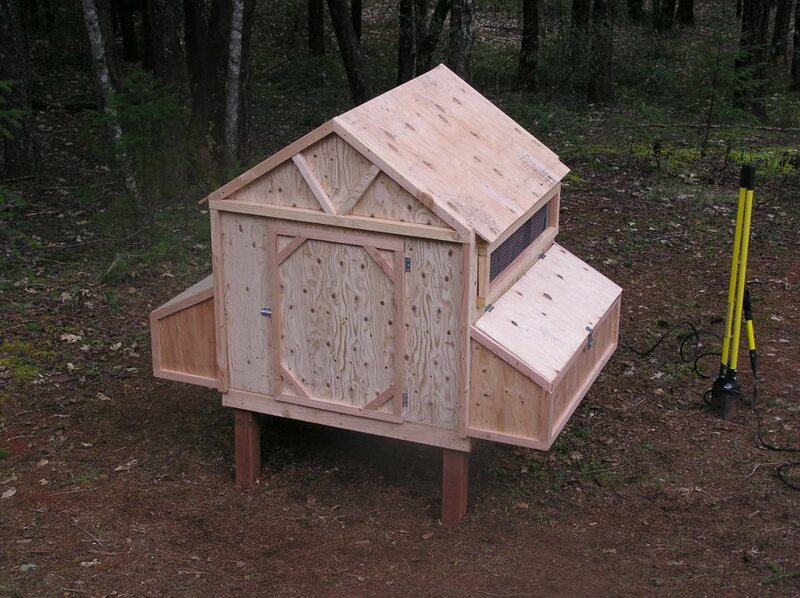 There is an almost infinite variety of housing options for chickens from the mobile "chicken tractors" or skids to full sized buildings or sheds. The size will depend on the number of birds you plan to keep as the other available area to which they will have access. It is important to have 2 doors. 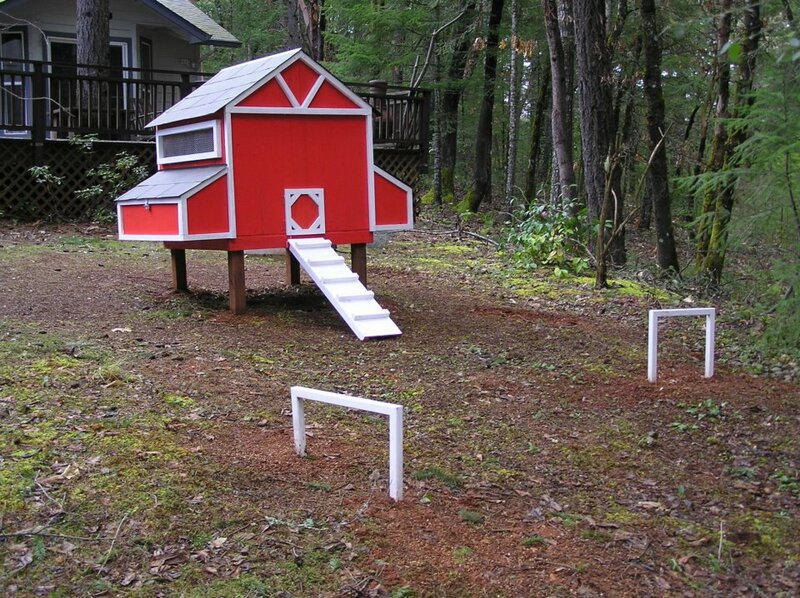 The smaller is for the chickens to to enter and exit, a "pop" door. 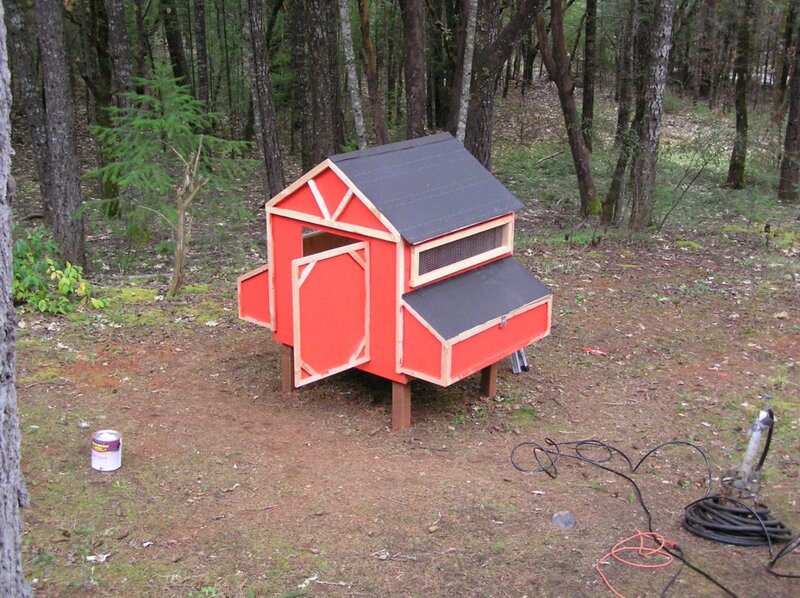 The larger is for you to use for cleaning out the coop and for maintenance. Here it is almost finished, only the trim left to paint. You can see the vents on the side. This gives warm moist air a chance to escape and screens keep out wild birds/animals. 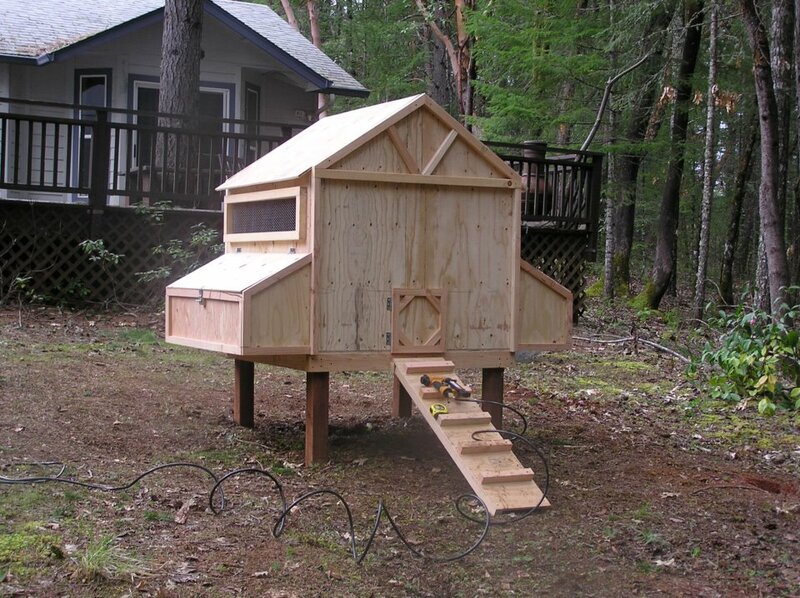 About one nest for every 4-5 laying hens is the general recommendation. We have 8 nest boxes for 10, which is definitely overkill as they tend to gather all the eggs into only one or two. The nests should be about 12-14 inches on all sides. Here is a view from the inside. 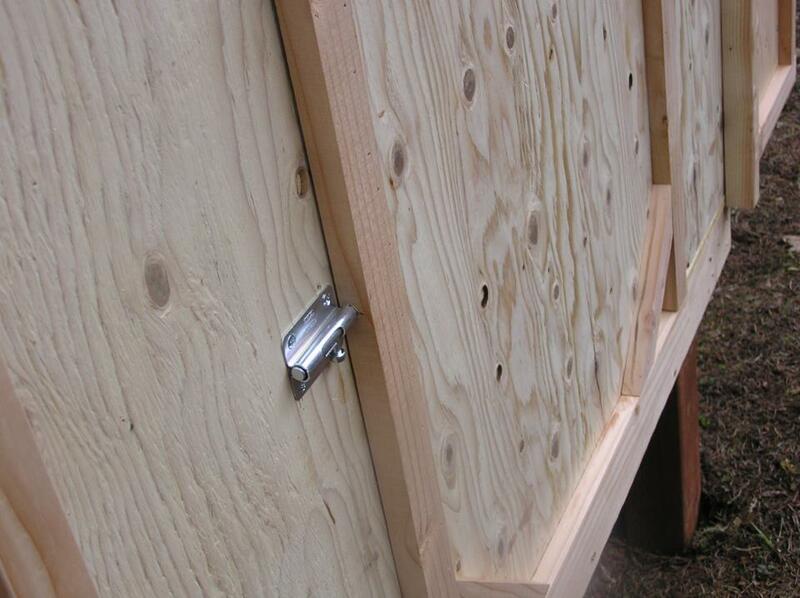 You can see some of the additional roosts as well as the pine bedding we use. Another great benefit is that when we clean out the coop the used bedding/manure makes great compost. A picture of the happy chickens. In the background is the automatic watering device we use. This was one of the best investments we ever made, it keeps the chickens healthy by providing constant access to clean fresh water, and we we don't have to worry about keeping their water full. We love our garden, but one of the major challenges of off-grid living is water. Even though we have multiple springs, creeks and wells; how do we get that water to where we need it? Although 2 wells have been dug on our property, we don't have a manual pump, nor do we have a power source to power a pump to get the water out of the well. This means we needed some ingenuity to keep our garden healthy and well watered. Luckily, I'm married to an amazing engineer, who came up with an ingenious solution utilizing what we have. Using our creek, a watering bucket, 5/8 poly irrigation tubing, a 2 60 gallon buckets, a 50 gallon drum, a washing machine Y mixer hose and a battery powered garden timer we have an automated watering system. The system starts with a watering can buried to the water level at the lip of a small waterfall. We have a screen over the opening to prevent large debris from getting in the water. From there the water goes to a 50 gallon drum that we use as an air separator and to let the sediment settle out before the water enters the irrigation hose. The irrigation hose then travels slightly downhill about 200 yards to our two 60 gallon buckets. The hose enters the far bucket at the top, but the two buckets are connected at the base with a washing machine Y mixer hose. This allows both buckets to fill evenly. The female ends of the hose are threaded into the buckets and the male end goes into the automatic garden timer. Meanwhile, any overflow is redirected back into the stream. The hose travels an additional hundred yards after the buckets to our drip system. And there you go, an automated off grid watering system. Today we spent some quality time in the garden. I love seeing the almost daily changes as the plants grow. Rogue (adj): no longer obedient, belonging, or accepted and hence not controllable or answerable; deviating, renegade. After living a life according to the general blueprint for success according to societies standards (school, college, medical school, residency and a solid job) we have realized something is missing. What we have realized is that if you follow the common path it will lead you to a common life. What we are realizing is perhaps the path we'd prefer is, "the road less traveled". We have purchased nearly 400 acres in the Rogue Valley, and are ready to embark on adventure! Our land is a mixture of fields, forest land, streams, an old orchard and the site of an old homestead. What it doesn't have is any sort of structure in which to live, electricity, running water, pretty much any of the "essentials" for modern living. We have started a large garden in which we grow onions, tomatoes, peppers, carrots, lettuce, asparagus, peas, green beans, potatoes, corn, sunflowers and, just to change it up, hops. Over the past several years we have been raising chickens, both for meat and eggs. Our goal is to set up a sustainable homestead. We plan on being energy self sufficient, growing our own food, raising animals and eventually building our own home.